YOUR RENTAL HOLYDAYS IN BASSUSSARRY. The mountain, the villages, the Spain and of course the Ocean and its fine sand beaches only based at 10 minutes. At the heart of Bassussarry Golf, the house is surrounding by a lovely private and closed garden. The Villa HAÏTZA is a very beautiful house in the “Pays Basque style”. It is only shared in 5 flats bringing a very quiet atmosphere. 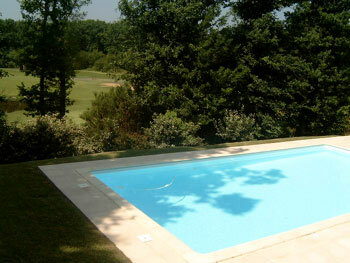 Including a swimming pool, the house is based at the boundary of the green N°5 with direct access. a second bedroom with two 0.90 m size beds, a bathroom with separate bath and shower. In addition, it is doted with a satellite TV and a very LARGE terrace with a sightseeing on the swimming pool and the golf.